Jr. Model UN at the VYMUN Whistler Conference. 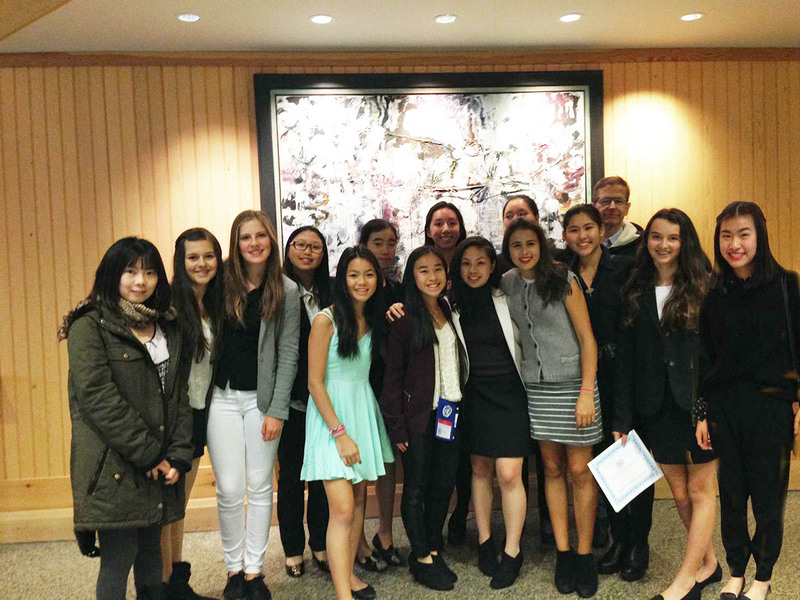 The YHS Junior MUN Club had a great time at the Vancouver Youth Model United Nations Conference (VYMUN) in Whistler the weekend of October 24-26. Saskia, representing Al Jazeera, received the Best Delegate Award on the UNACJ Committee. Isabelle, representing ISIS, received the Best Delegate Award on the Security Council. Elsa, representing Iraq on the Interpol Committee: Honourable Mention. Anna, also representing Iraq on the Interpol Committee: Honourable Mention. Jocelyn, representing Singapore on the IMF Committee: Honourable Mention. The theme of the conference was “Common Ground”, highlighting conflict resolution. The girls worked hard and learned a lot about international issues, problem solving and conducting negotiations. A special thanks to Min Kim who helped chaperone this trip, as well as the VMUN Vancouver trip last year. Next PostNext More Volleyball Wins!